My current main indoor job is painting the door frames & linings that are still in their original state – untreated timber linings and white coated MDF architraves. Here are a couple pictures of them in their ‘before’ state. I suspect there won’t be a great deal of visual difference ‘after’ as all I intend to do is paint the door frames & linings white and leave the doors as they are, but we’ll see. I’m using Little Greene undercoat and eggshell paint following some advice I received via Twitter user @CharlieBudd, so far it seems to be a nice product. I’ll provide a more in-depth report later on. One of the main jobs that remains internally is to install doors. It actually seems a shame to put in doors and close up some of the openness of the barn at the moment, but I guess privacy and decency must prevail. There are only five doors to be installed. All doorways are between 78 & 79 inches high and all upstairs doors are 33 inches wide with the utility room narrower at 30 inches. 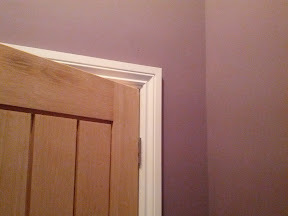 So here for reference are my doorways in their pre-door state. Door through to main bedroom. Two of the upstairs doors - left the door through to the second bedroom and right the door to the bathroom. Door to spare bedroom (currently storing various junk and supplies).